IdentaMaster Pro software works with any biometric scanner of your choosing. IdentaMaster Pro revolutionizes the biometrics market by offering the first system of its kind designed specifically for consumer use. 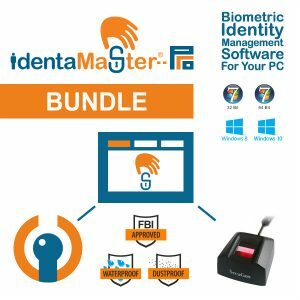 IdentaMaster Pro is an identity management program that is compatible with and interoperable with a variety of biometric devices currently available on the market. Currently, IdentaMaster Pro works with several types of biometric technologies and biometric scanners, and in the near future, users will be able to work with the full range of biometric technologies (fingerprint, finger/vein, palm, iris, facial, voice, brain, etc) and scanners across almost all leading biometric manufacturers around the world. What is different about IdentaMaster Pro compared to others in this field? Our innovative system is designed to make sure that biometrically encrypted data won’t be stolen by outside parties while being shared, synchronized or sent via publicly accessible cloud services (Dropbox, Silversky, GoogleDrive, etc). IdentaMaster Pro easily interoperates with other messaging communication systems and will eventually evolve to facilitate information exchanged through any cloud storage platform. IdentaMaster Pro provides the user with the unique ability to combine and work with different biometric technologies and devices simultaneously. This unparalleled platform independence makes it possible to switch from one device to another during use. For example, information can be encrypted with one type of biometric technology and decrypted using another. IdentaMaster Pro is a truly unique, innovative solution providing users with a revolutionary new method of protecting data which resolves many of the issues previously faced within the world of biometric security. Please note that IdentaMaster Pro is created for domain networks.